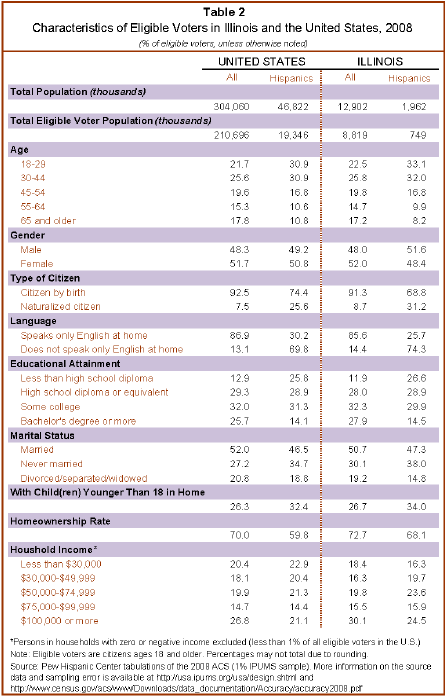 The Hispanic population in Illinois is the sixth-largest in the nation. Nearly 2 million Hispanics reside in Illinois, 4% of all Hispanics in the United States. The population in Illinois is 15% Hispanic, the 10th-highest Hispanic population share nationally. There are 749,000 eligible Hispanic voters in Illinois—the sixth-largest Hispanic eligible-voter population nationally. California ranks first with 5.4 million. More than 8% of eligible voters in Illinois are Latinos, the tenth-largest Hispanic eligible voter population share nationally. New Mexico ranks first with 38%. Some 38% of Latinos in Illinois are eligible to vote, ranking Illinois 25th nationwide in the share of the Hispanic population that is eligible to vote. In contrast, 77% of the state’s white population is eligible to vote. Age. One-third (33%) of Hispanic eligible voters in Illinois are ages 18 to 29, more than the share of all Latino eligible voters nationwide (31%) in that age range. 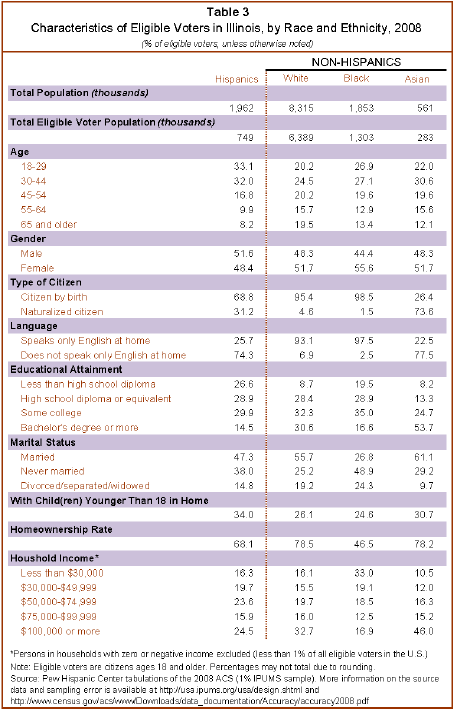 By contrast, only 23% of all Illinois eligible voters and 22% of all U.S. eligible voters are ages 18 to 29. Citizenship. Three-in-ten (31%) of Hispanic eligible voters in Illinois are naturalized U.S. citizens, compared with 9% of all Illinois eligible voters. Hispanic eligible voters in Illinois are less likely to be native-born citizens (69%) than are Hispanic eligible voters nationwide (74%). Educational Attainment. More than one-quarter (27%) of Latino eligible voters in Illinois have not completed high school. That was similar to the rate for all Latino eligible voters—26%—but greater than the rate for U.S. eligible voters nationwide—13%. Homeownership. Nearly seven-in-ten (68%) of Hispanic eligible voters in Illinois live in owner-occupied homes, compared with 60% of all Hispanic eligible voters nationwide. Somewhat greater shares of all eligible voters in Illinois (73%) and all eligible voters nationwide (70%) live in owner-occupied homes. Number of Latino Eligible Voters. Latino eligible voters are outnumbered by white eligible voters in Illinois by more than 8 to 1—749,000 Latinos to 6.4 million whites. Age. 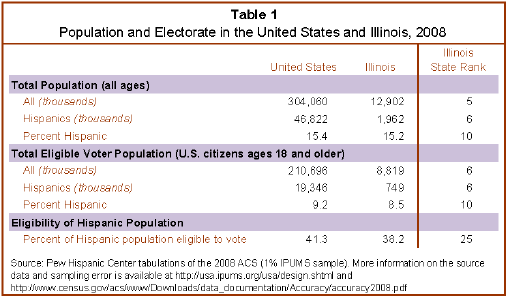 Latino eligible voters are younger than other major racial groups in Illinois. One-third of Latino eligible voters in Illinois (33%) are ages 18 to 29 compared with 27% of black eligible voters, 22% of Asian eligible voters and 20% of white eligible voters. Educational Attainment. 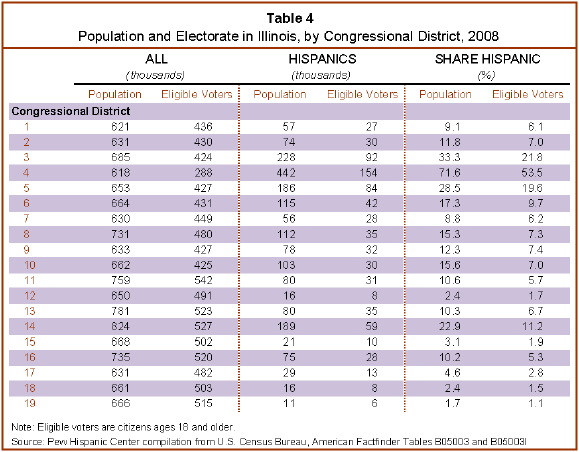 Hispanic eligible voters have lower levels of education than do white and black eligible voters in Illinois. Some 27% of Hispanic eligible voters have not obtained at least a high school diploma compared with 20% of black eligible voters and 9% of white eligible voters. Homeownership. Hispanic eligible voters in Illinois are less likely than white eligible voters, but more likely than black eligible voters, to live in owner-occupied homes—68% versus 79% and 47%, respectively.